My friend Goran Grubic used to do the most hilarious imitation of different national methods of nymphing, the joke being that they all looked exactly the same to the observer. But Czech nymphing really is different, a killing method that was kept a dead secret for many years and was responsible for winning several World Championships. If you are a coarse angler, don’t turn your back on this method, because it has taken some big barbel and it doesn’t take long to learn, nor does it demand anything other than the most standard of equipment. 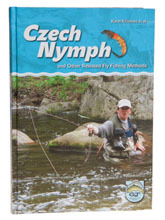 Mastering Czech nymphing, ah... that’s a different matter – getting good at it takes years and when you watch an expert it is about as near to magic as anything you can imagine, short of producing fish out of a hat. And this is the best text I have ever read on the subject, not only because it is, as far as I know, the first comprehensive work to appear about Czech nymphing, but also because it is well written and finely illustrated.